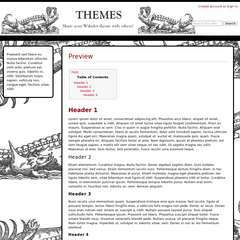 This theme is stylish, easy to read and allows for a full width customised logo and a page background. The theme is extended from Shiny. To see this theme in action visit Forteana, Camborne Old Cornwall Society, An Index to the Historical Place Names of Cornwall or Postcards of Cornwall. The best way to use this theme is to click on 'show the code' above and then cut and paste the code as a custom theme. Then create and upload your own custom header (1000px x 130px, or wider if you want, but 130-150px seems to be the optimum height for the header), leaving some space on the right hand side for the search box, and an image to use as a repeatable background to your admin:manage page and then edit the custom code to use your header and background.